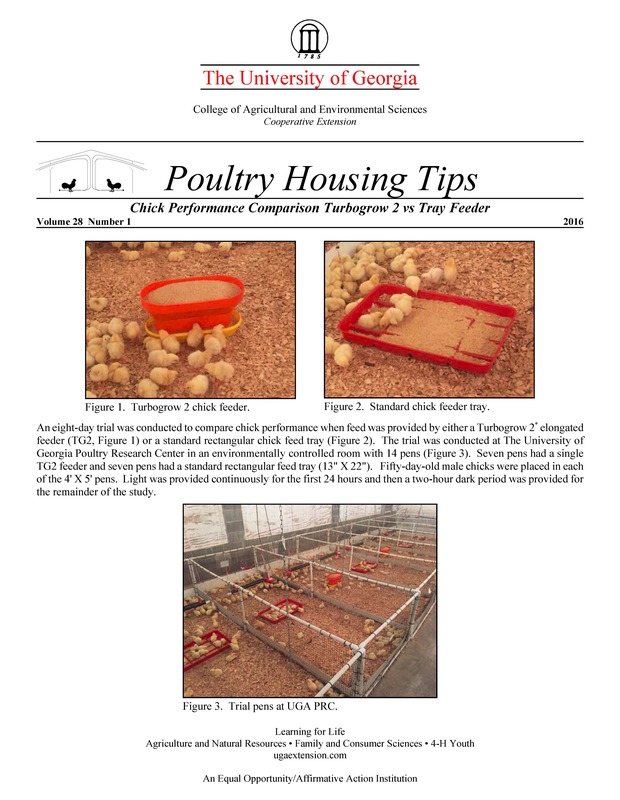 An eight-day trial was conducted to compare chick performance when feed was provided by either a Turbogrow 2* elongated feeder (TG2) or a standard rectangular chick feed tray. The trial was conducted at The University of Georgia Poultry Research Center in an environmentally controlled room with 14 pens. Seven pens had a single TG2 feeder and seven pens had a standard rectangular feed tray (13" X 22"). Fifty-day-old male chicks were placed in each of the 4' X 5' pens. Light was provided continuously for the first 24 hours and then a two-hour dark period was provided for the remainder of the study. Prior to chick placement, 8.8 lbs of feed was added to each TG2 feeder and 4.4 lbs of feed was added to each feeder tray. The feed was weighed six hours after placement and then daily throughout the study. Chicks were weighed at 0, 5 and 8 days of age. Chicks were weighed individually at eight days of age in four pens from each treatment to evaluate differences in chick uniformity. The feed and manure in the control pens were separated using a sieve to estimate how much manure accumulated in the feeders. There were no statistical differences in mortality with no pen losing more than two birds during the study. Feed consumption was statistically greater in the feeder tray treatment on days 1, 4, 5 and 7 (1 g/chick, 1g/chick, 2 g/chick, 4g/chick, respectively). No statistical differences in feed consumption were observed on the other days. Overall, the feeder tray chicks consumed more feed than the TG2 chicks (6 g/chick). Feed wastage was not objectively monitored in this study. However, birds were not observed scratching feed out of the tray and no feed was seen on the litter. This does not necessarily indicate there was no feed wastage, but if it did occur the amount was such that it could not be seen in the fresh pine shavings used as the bedding material. Body weights were only found to be significantly different at the end of the study with the TG2 birds weighing 6 grams heavier than feeder tray birds. No significant differences were noted in body weight uniformity at the end of the trial with feeder tray=9.4% and TG2=10.1%. The feed conversion for periods 0 to 5 days, 6 to 8 days, as well as 0 to 8 days were significantly lower in the TG2 treatment. The TG2 feeders performed similarly in feed usage and had a higher feed-holding capacity when compared to the traditional chick feeder trays. Since the chicks were not standing in the feed, the TG2 feeders had no manure present. The feed usage at 6, 24 and 48 hours indicates that the chicks fed from both types of feeders found feed in a similar fashion. At the end of the first week, the chicks in the feeder tray treatment used more feed but the TG2 birds had slightly better body weights and feed conversion.